As a nation we love the football world cup, and even if you don’t like football it’s impossible not to get caught up in the frenzy. 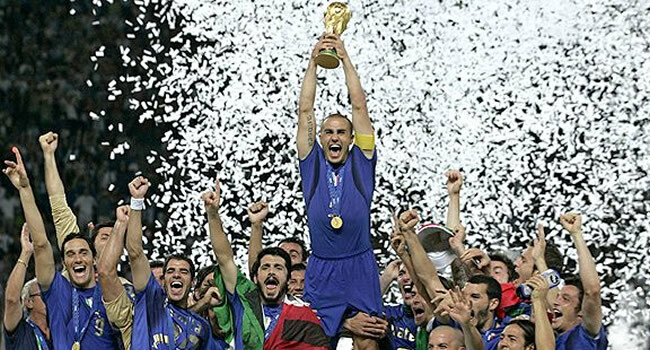 The other day I was thinking about some of my world cup memories and before long my mind had drifted to reptiles (this happens a lot!). The end result of this bizarre thought pattern was me linking some memorable world cup moments to some of my favourite reptiles. I thought I’d share them with you. There will be loads more no doubt that you can think of, so please add them in the comments section at the bottom. 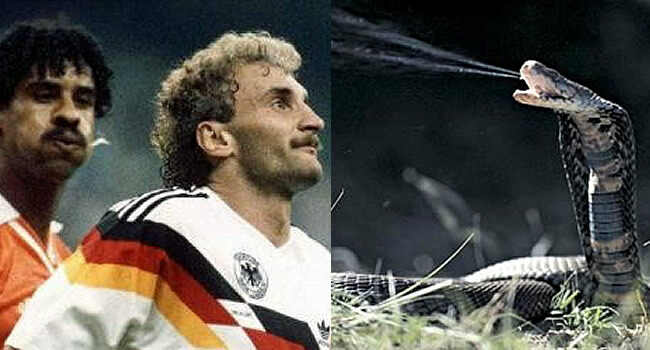 I for one, thought Rudi Voller’s perm was the work of the devil. Frank Riijkaard also took offence and spat in it during West Germany’s 2-1 win over The Netherlands at Italia ’90. 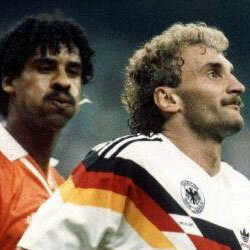 I wasn’t very impressed by Frank Riijkaard spitting in Rudi Voller’s hair though, it traveled 3 feet at best! 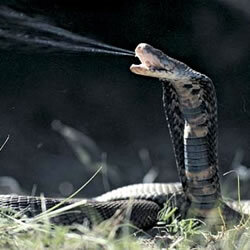 The Spitting Cobra (Naja spp.) 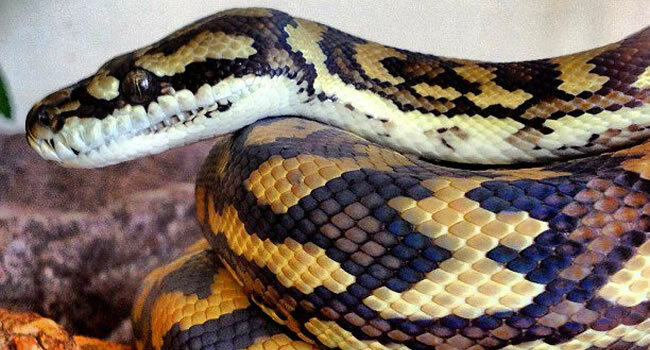 can get it’s venom over 2 meters and it can cause blindness. Much more inconvenient than a bad hair day. 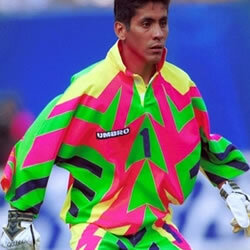 Jorge Campos was one eccentric goalkeeper. He is best remembered for his self designed kits that were… bright! During USA ’94 his attire was a particularly extravagant blend of pinks, greens, purples and yellows. 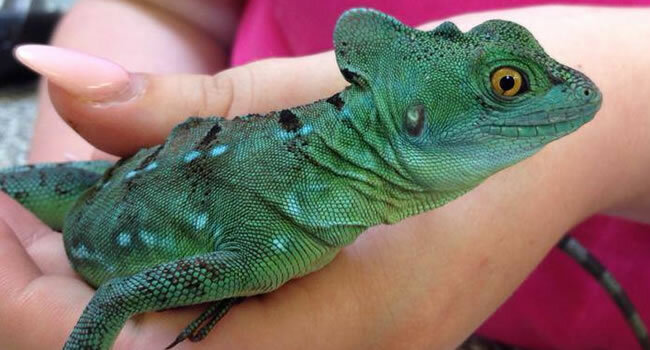 Not too dissimilar to a Panther Chameleon (Furcifer pardalis). 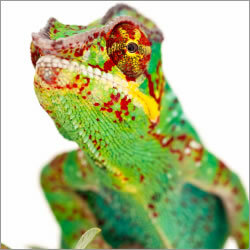 Chameleons don’t have to wait until half time to change colour though, they have special cells called chromatophores in their skin that can quickly change colour to display mood and physiological condition. 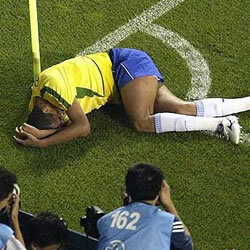 Who remembers Rivaldo getting hit in the arm with a football and then going down holding his face? This play acting got Turkey’s Hakan Unsal sent off during their game with Brazil at Japan/ Korea ’02. 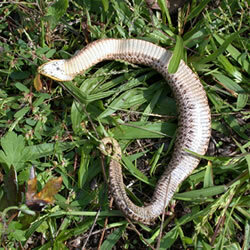 This style of acting has been used before, by Hognose snakes (Heterodon spp.). They go one better though and pretend to be dead! 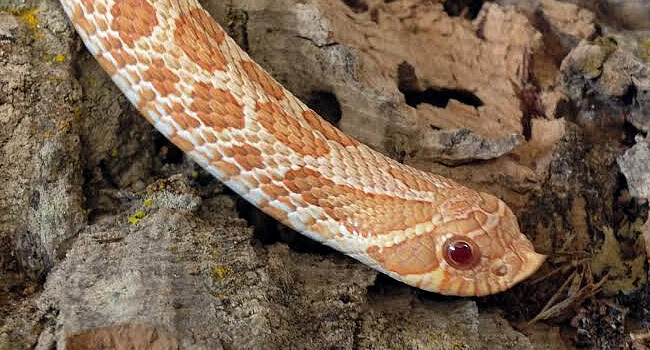 Hognoses also emit a foul smell to really add to the effect. The result? Predators are really put off! 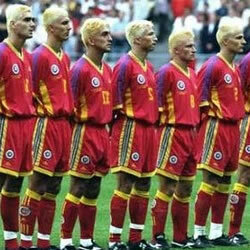 Before the game with Tunisa at France ’98 the entire romanian team randomly decided to bleach their hair! 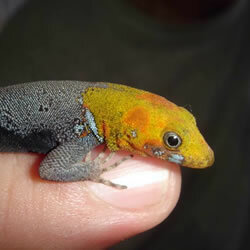 They kind of resembled Yellow Headed Geckos (Gonatodes albogularis fuscus). These are really cool little lizards, growing to only a few inches. Zinedine Zidane certainly knows how to end a career in style (or not). The Frenchman’s last game was the Germany ’06 world cup final where he scored and was also sent off. He was sent off for heatbutting Marco Materazzi of Italy. 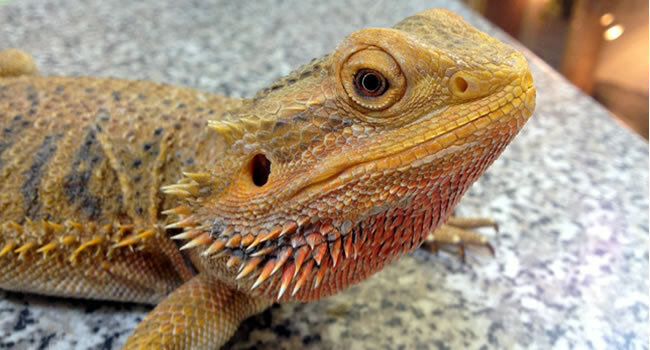 Whilst I’m not familiar with any reptiles that like to headbutt, male Bearded Dragons (Pagona vitticeps) do like a good head bob (ok, I’m starting to run out of ideas!). 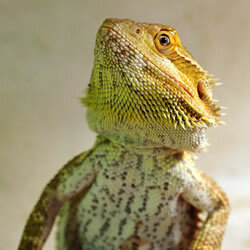 They do this to display their strength and virility to the ladies and let any contenders know that they’re the boss. Don’t forget to add your own to the comments section below. 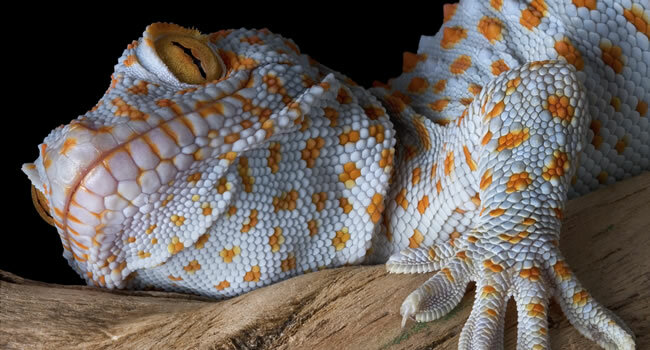 Have you ever seen a freshly hatched Leopard Gecko? Are you ready for this years breeding time?